This book is way out of my league I have to admit. 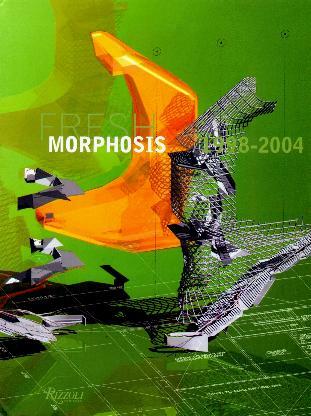 I'd not seen any previous Morphosis volumes so I was going in cold. Visionary architect Thom Mayne, along with his Morphosis company (formed in the early 1970s), produces modernistic architecture. Mayne is described as both obsessive and agressive, and I guess, passionate about what he does. After the lengthy and rather academic introductions, there are 400-odd pages of their work. Again, I know diddly about architecture but I know what I like and I love ogling city buildings but never get to see the insides. Morphosis designs company space and among other projects, a pedestrian bridge; a school; a winery; a New York park; student recreation center; courthouse; high schools; graduate school housing; a federal office building; museum; satellite operations facility; an Olympic village; a bank (looks like a space station); housing, and surprise surprise, an architectural school. Drawings, intricate as they are, are also included which will benefit those who like to look at the specifics. The attention to detail is staggering. Thom Mayne is also one of the founders of the avant-garde institution SCI-Arc (Southern California Institute of Architecture in Los Angeles). Conclusion - A great book of inspiration for designers and architectural students of any age. Rather fascinating.